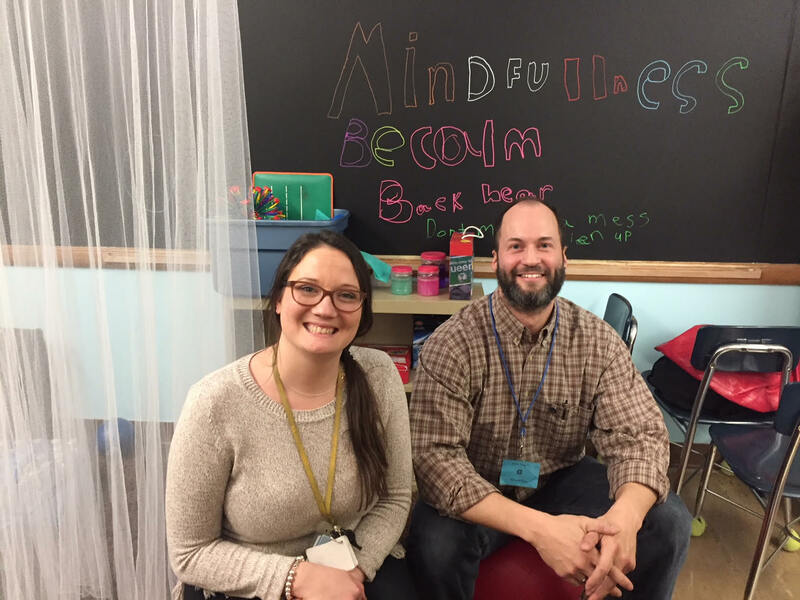 Lyon Magnet School is in their second school year using Calm Classroom mindfulness training for staff and students. 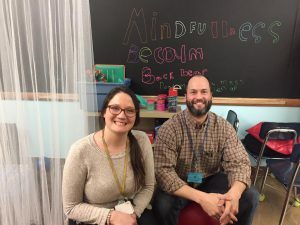 Principal Amanda Pryce and Wellness Practitioner Ismael Rosa have led the way for staff, students, and parents to benefit from using breath control, stretching, and relaxation to improve focus and remain energized and engaged through the school day. Ismael works with entire classrooms at a time as well as small groups of students. The Calm Classroom initiates offers alternatives to traditional disciplinary actions and offers students opportunities to calm themselves. They have a mindfulness recess club and use it as part of their Restorative Discipline Plan to help students decompress. Lyon is implementing mindfulness practices daily. Pictured below are Principal Amanda Pryce and Ismael Rosa in the Peace Room space at Lyon.